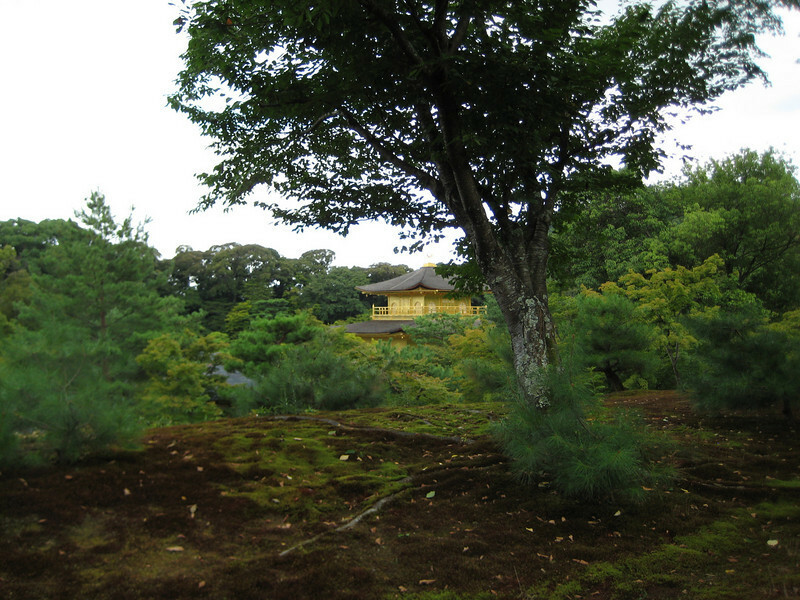 On our agenda for what would be our last full day in Kyoto was Nijo Castle, Kinkaku-ji (Gold) Pavilion, Ginkaku-ji (Silver) Pavilion and the Sanjusangen-do Temple. 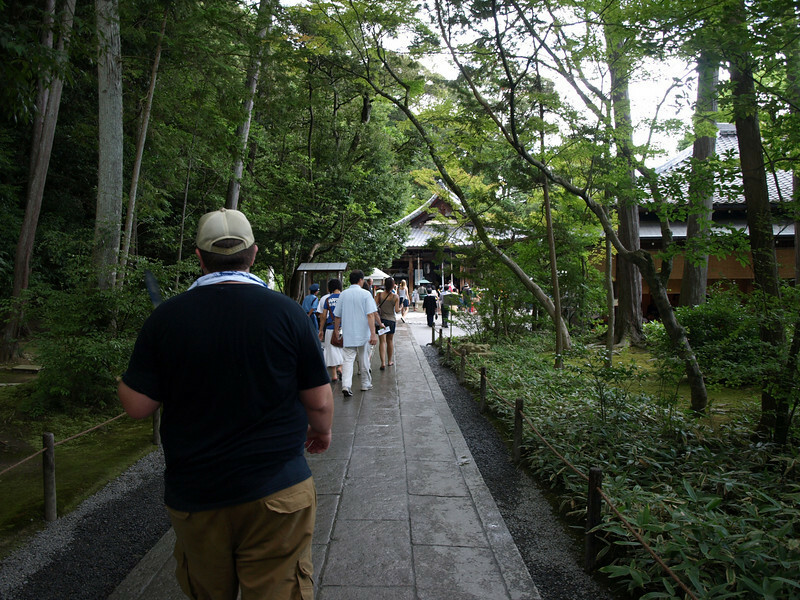 As these four temples were almost literally at the four corners of Kyoto, we planned to use the bus system to get us from site to site. 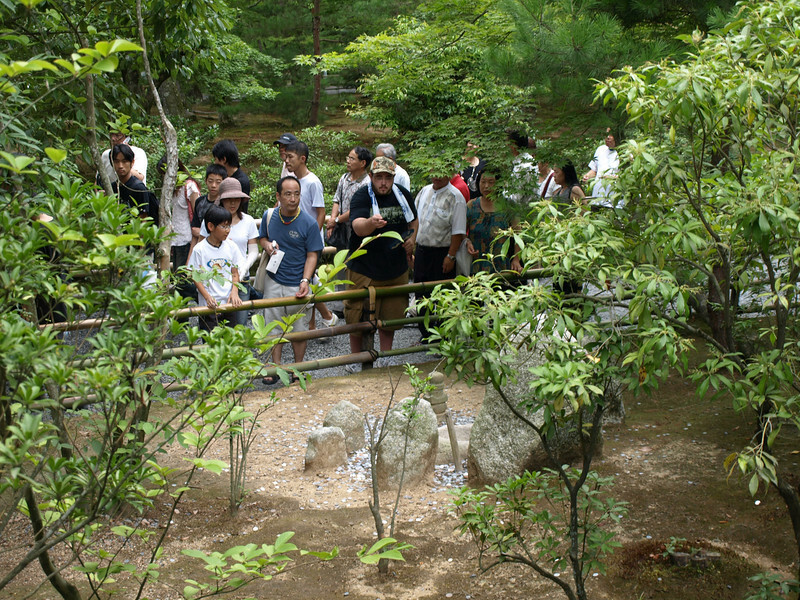 A variation on the wishing well. 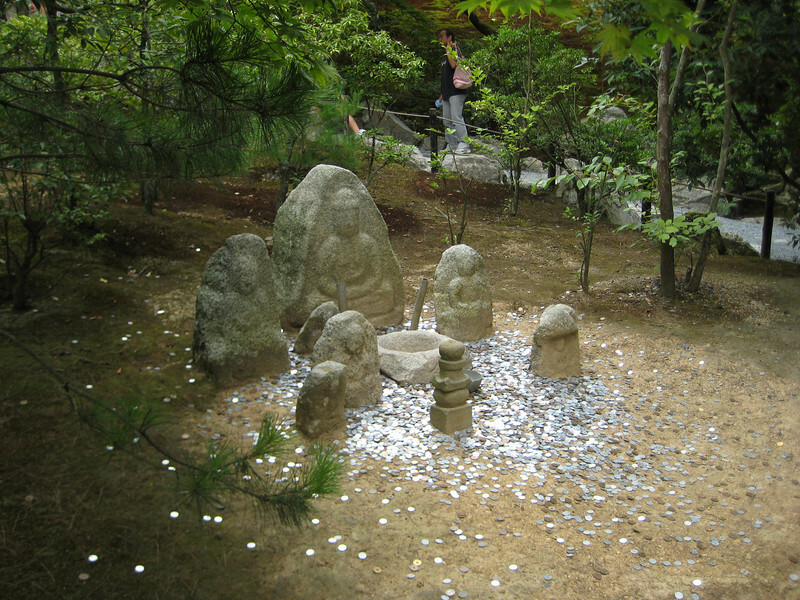 If you can toss your coin into the stone bowl in the center, your prayer will be answered. 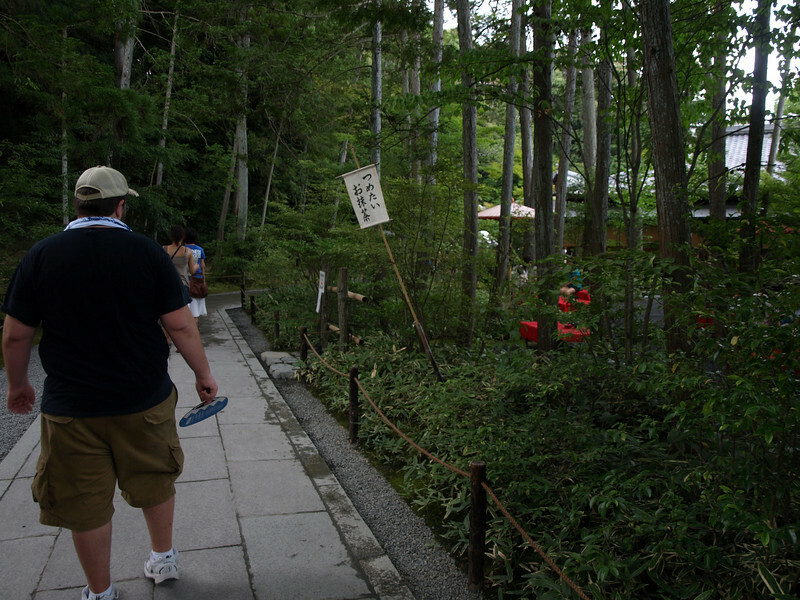 The path takes a sharp jog around this bowl, so from the back side, here is a view of Josh trying his hand at the toss. 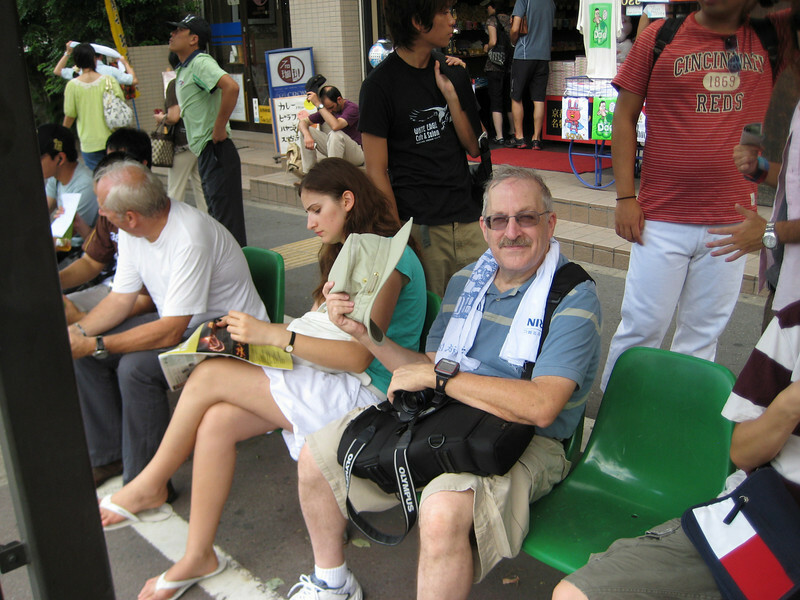 I have to say that there is a certain attraction to donating when there is an element of chance. 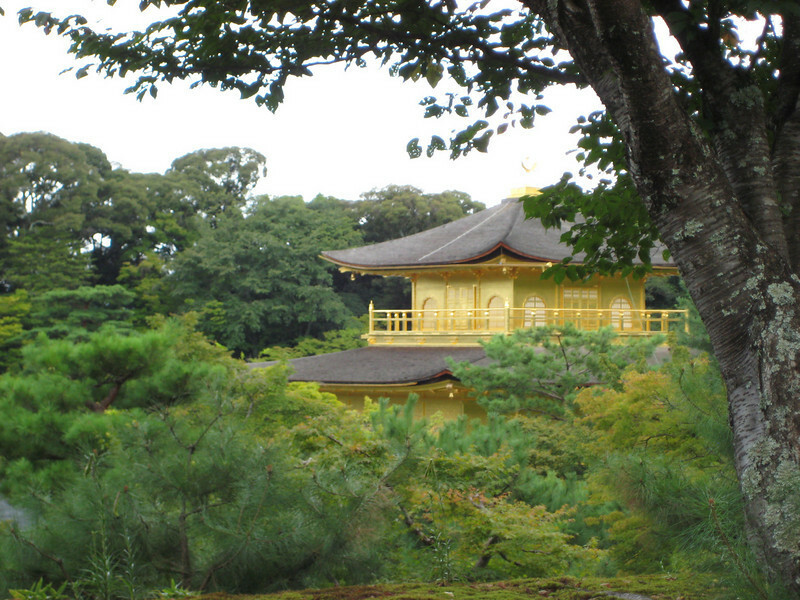 The third floor of the Golden Pavilion is built in the style of a Zen temple and is known as the Kukkyôchô ("Superb Apex"). 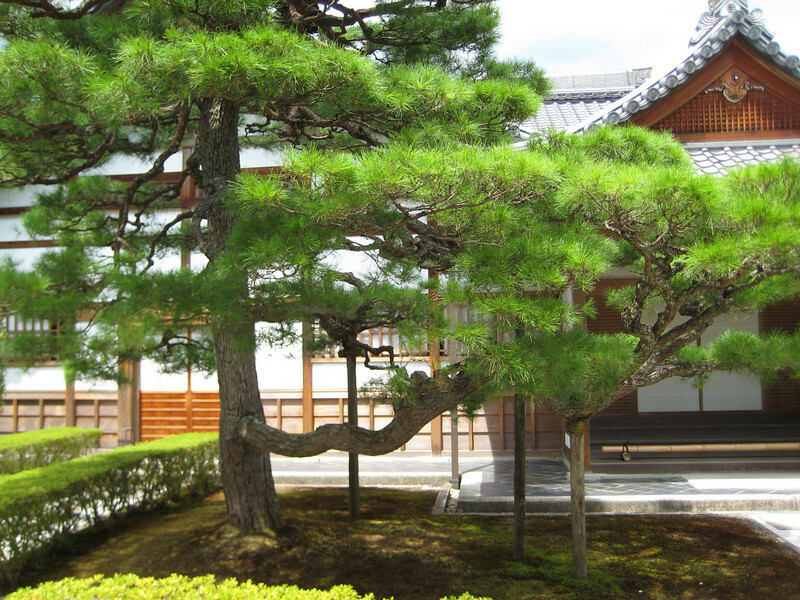 Inside is sheltered an Amida triad and 25 Bodhisattvas. 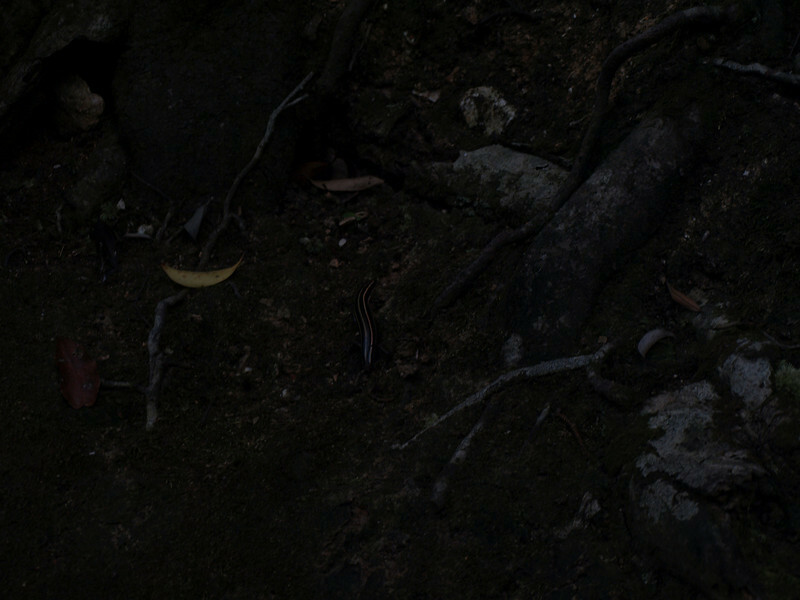 Josh notes a centipede crawling among the loam. 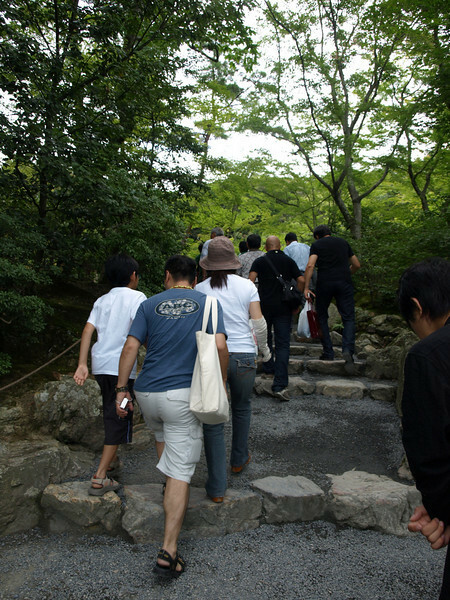 Having finished with our tour, we start the long trip down. 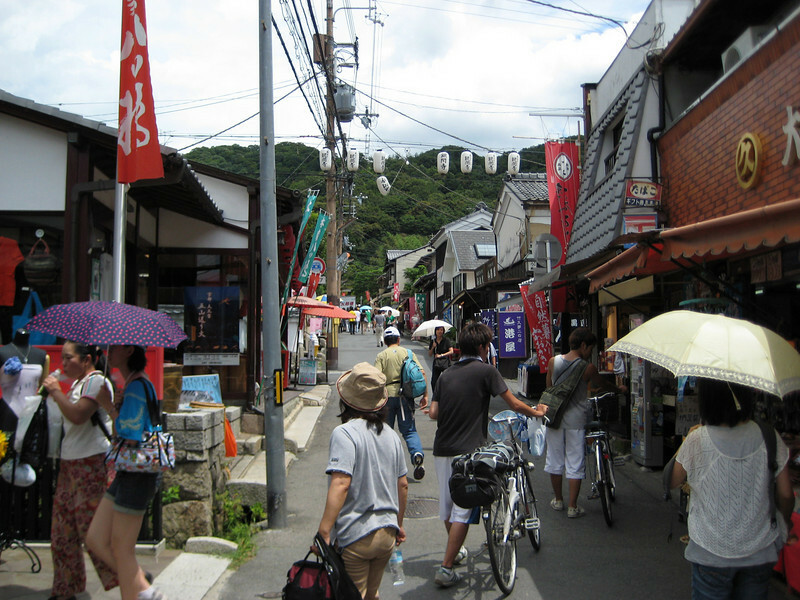 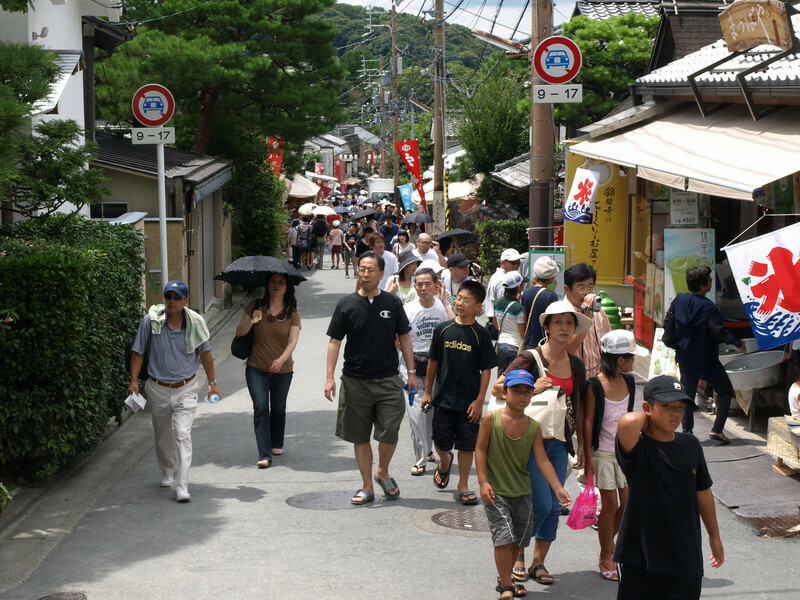 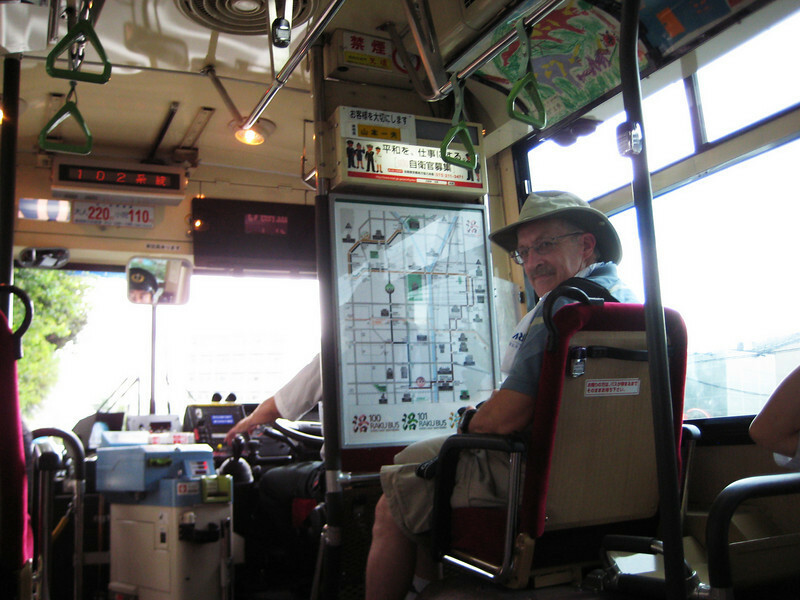 Traveling along the north side of Kyoto along the Imadegawa Dori street on our way to our third stop of the day. 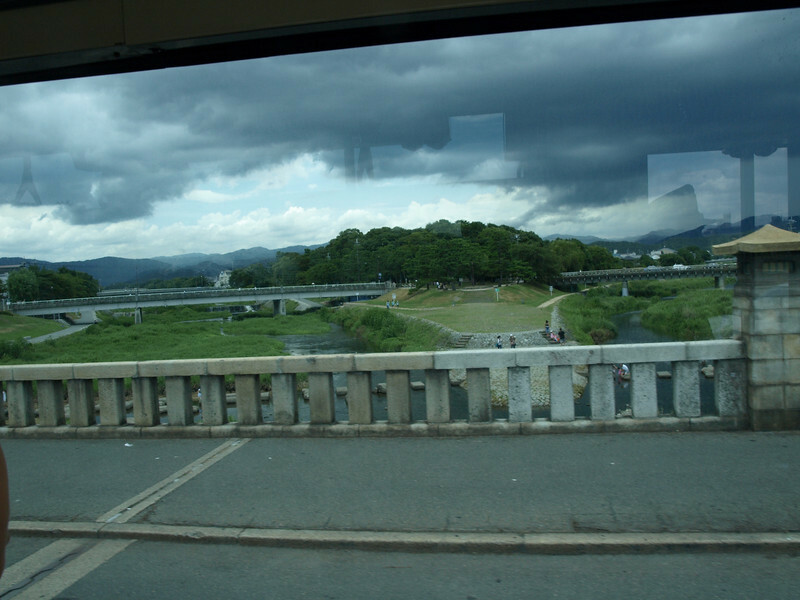 Looking south as we pass the Kamo River (Kamogawa). 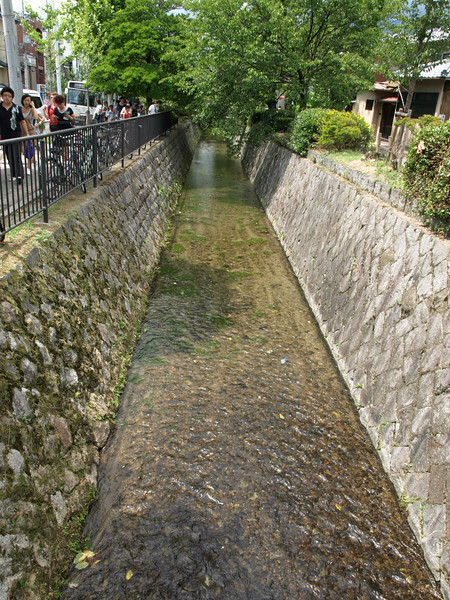 Looking north on the Kamo River. 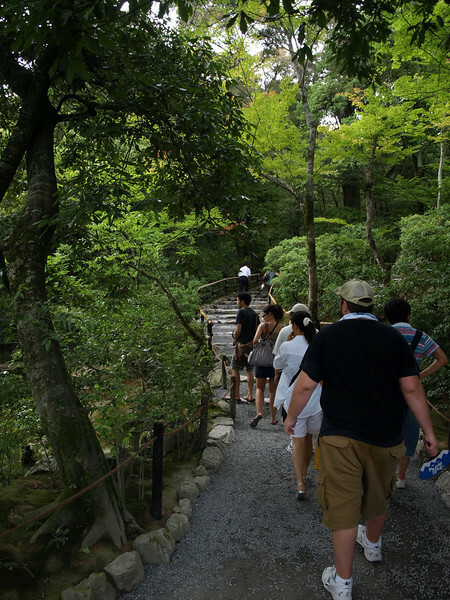 Note that the river splits in two here and, visible through the bridge rails, are large stepping stones that allow pedestrians to cross the river. 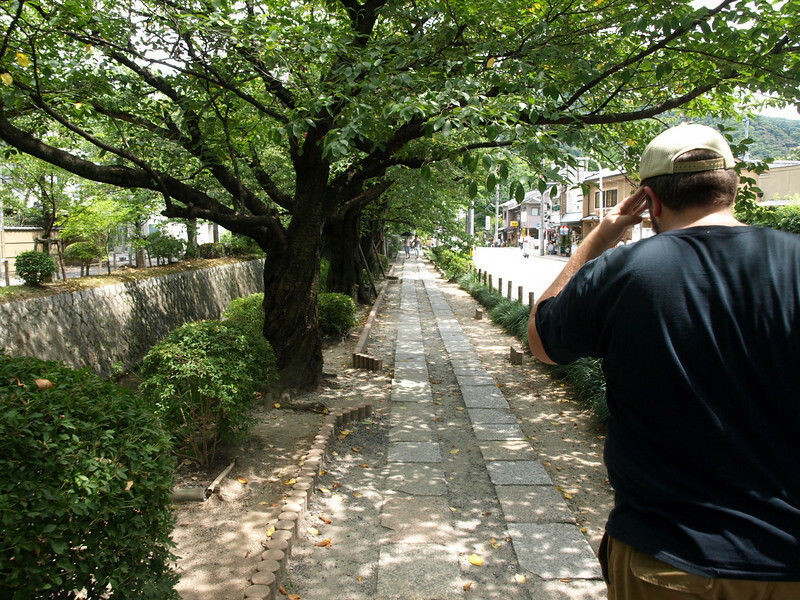 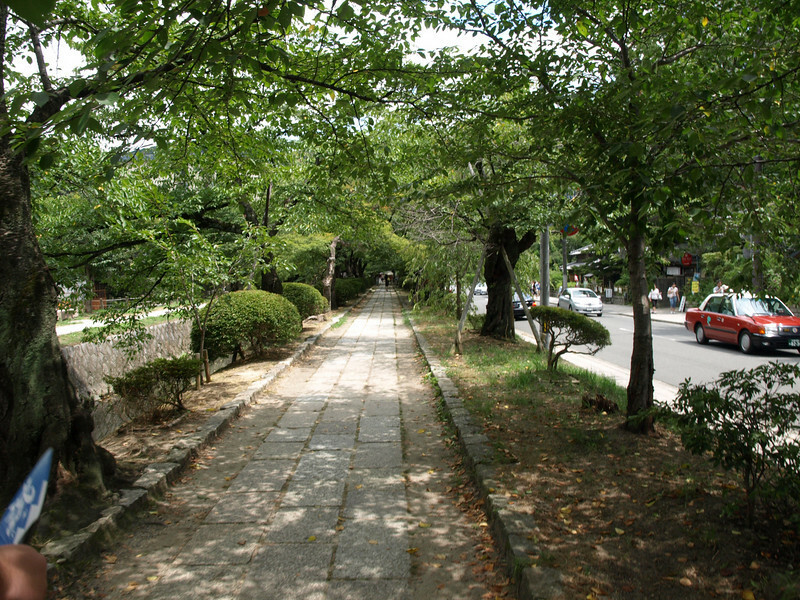 Although we found a shady walk, it was still brutally hot. 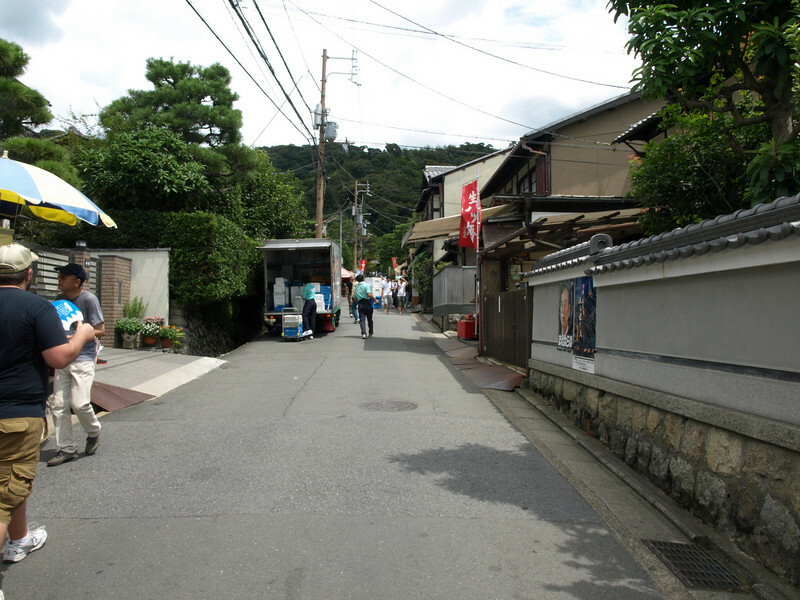 The bus dropped us off several blocks from the temple, so we were looking at a walk of about a half mile to get to our destination. 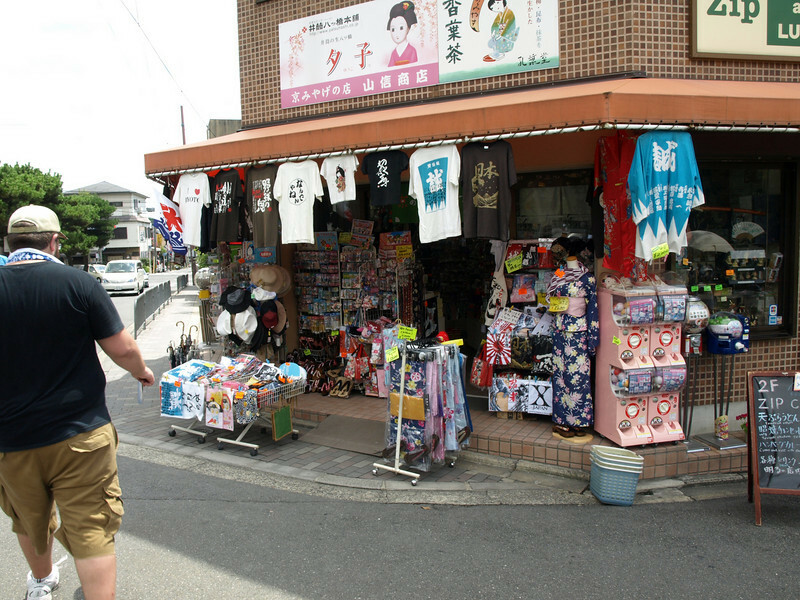 Fortunately, part of the walk took us among many shops and souvenir stands. 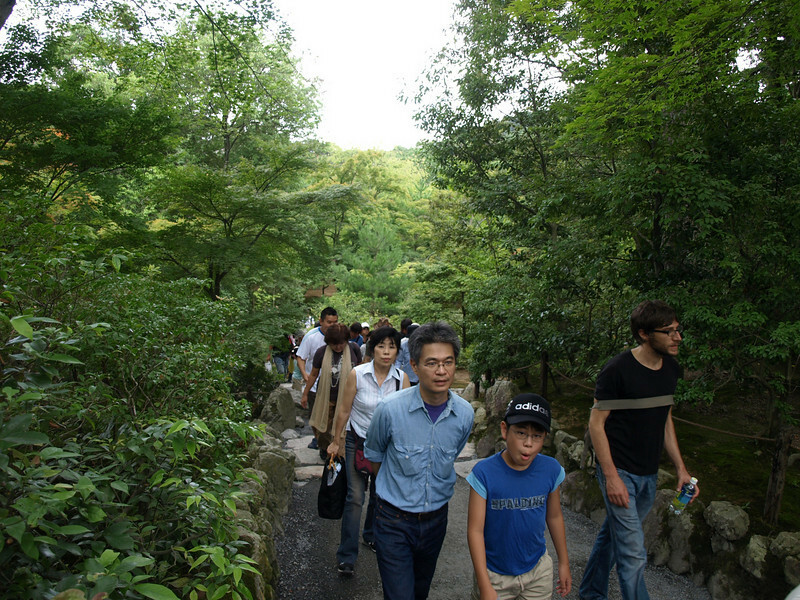 We've been walking for about 10 minutes now. 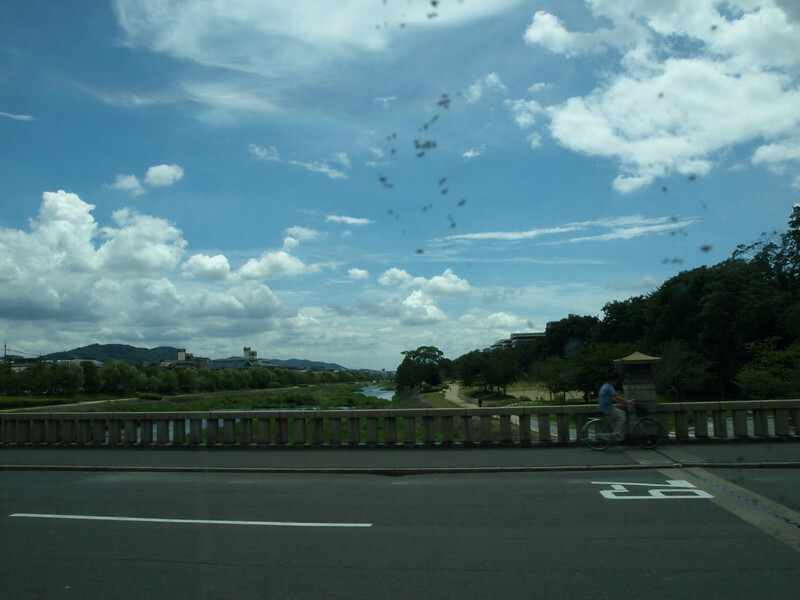 15 minutes since we got off the bus and we are almost to the temple. 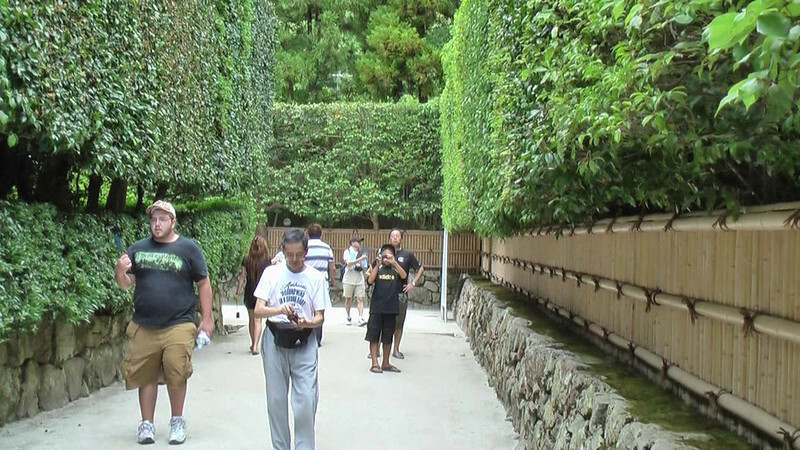 For our third stop, we had decided on the Ginkakuji (Silver) Temple. 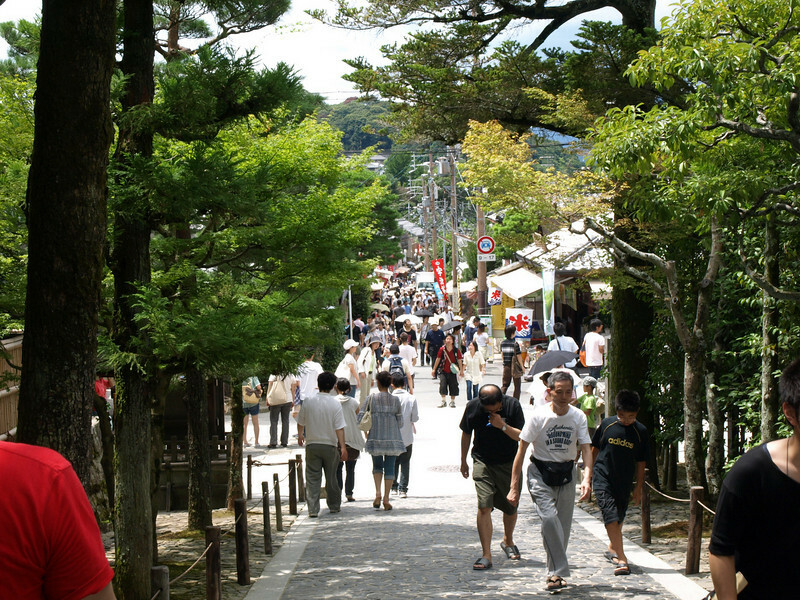 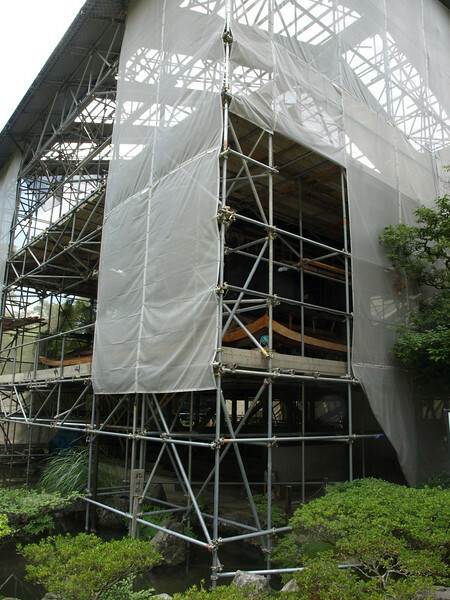 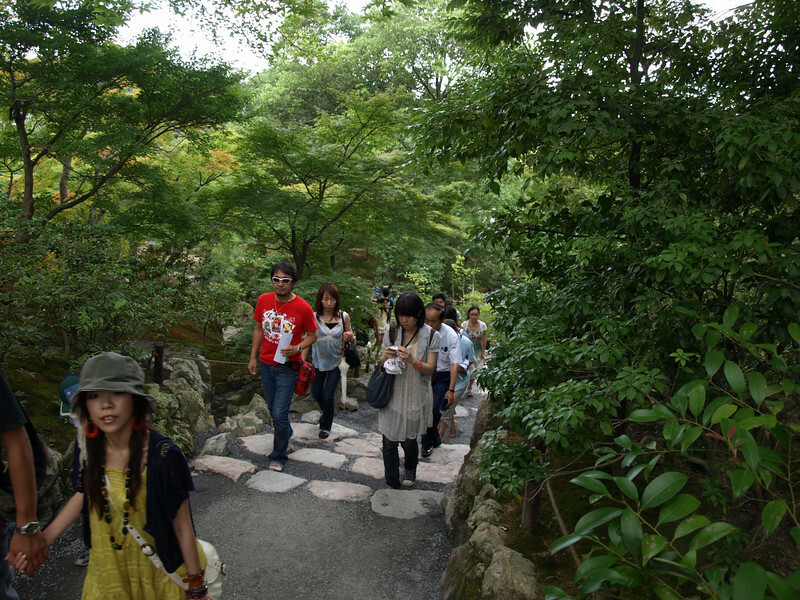 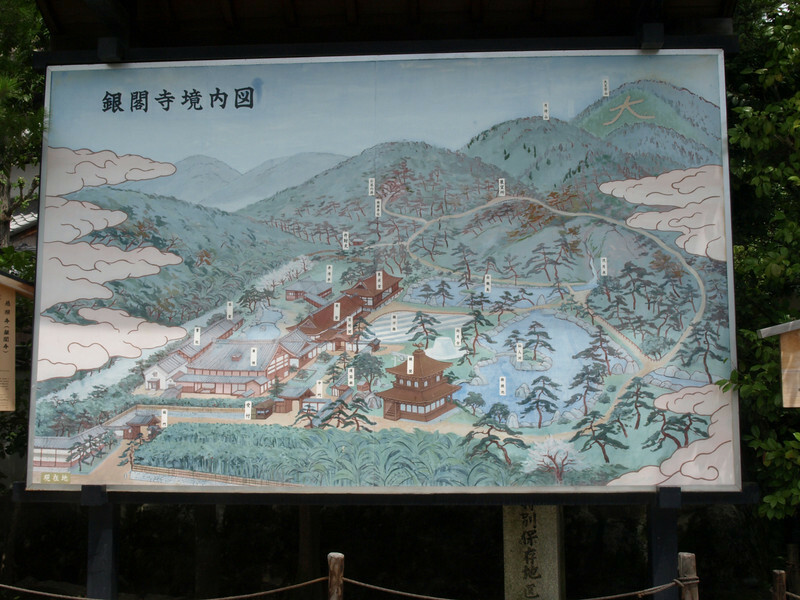 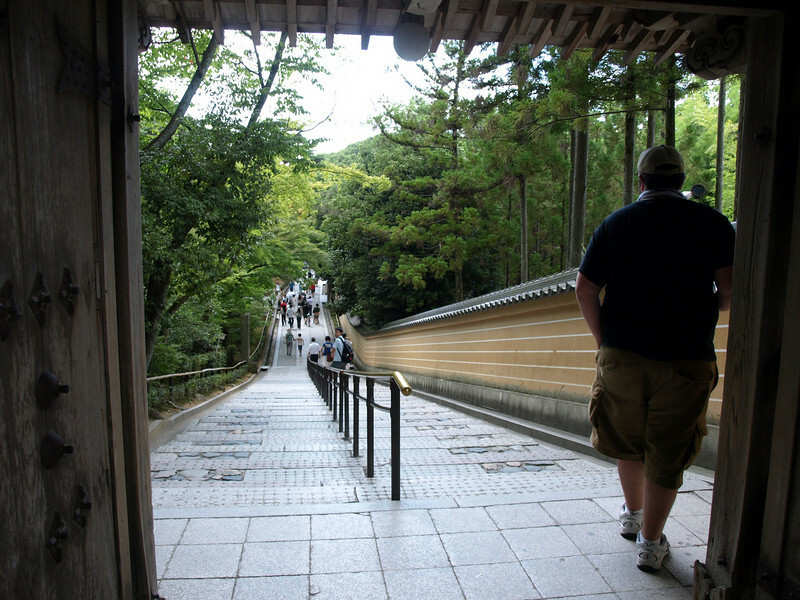 This is an overview of the main part of our visit to the Ginkakuji Temple. 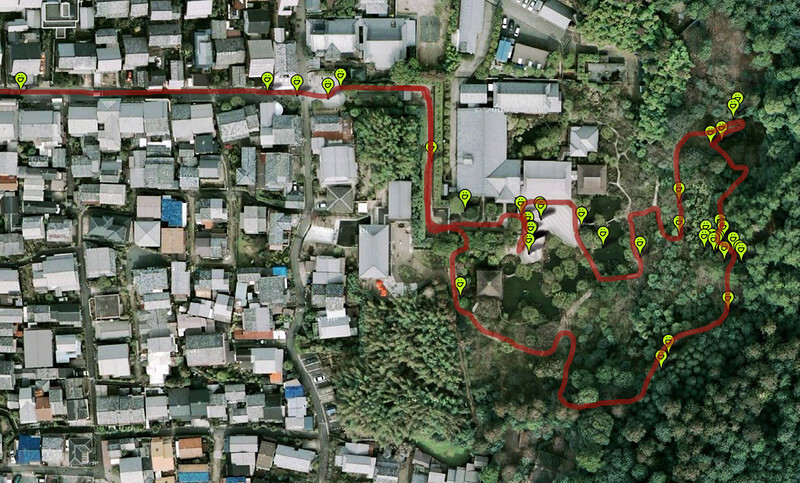 In total, we ended up walking about 1.5 miles, a half mile each way between the bus stop and the temple and a half mile walking the temple grounds. 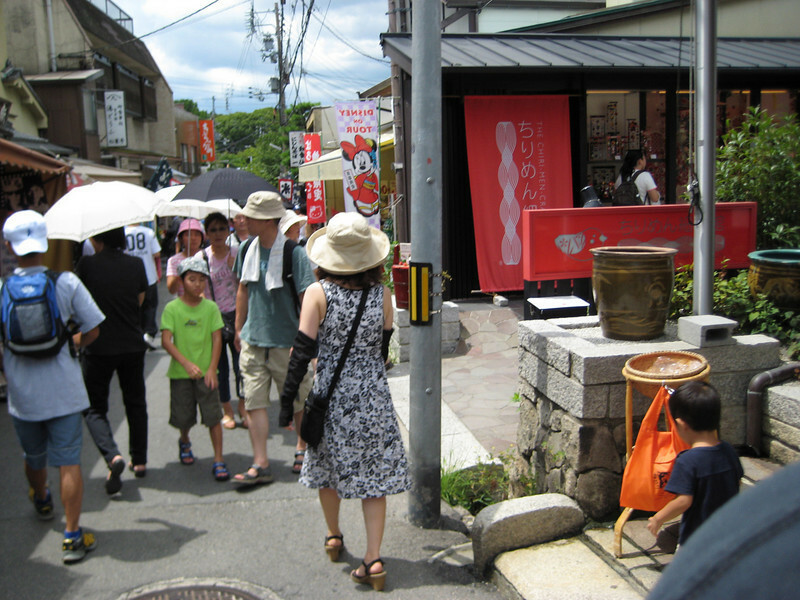 A look back at the shops as we step into the temple entrance. 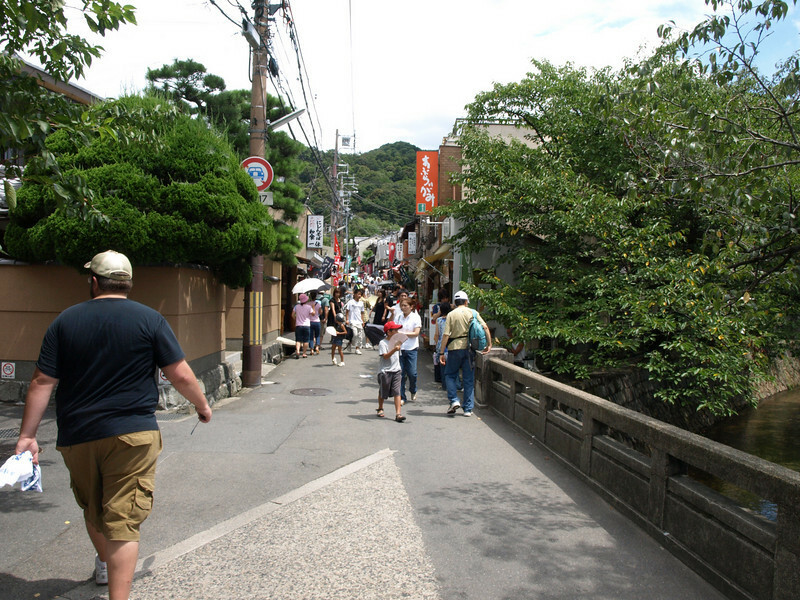 A brief view of the initial part of our walk. 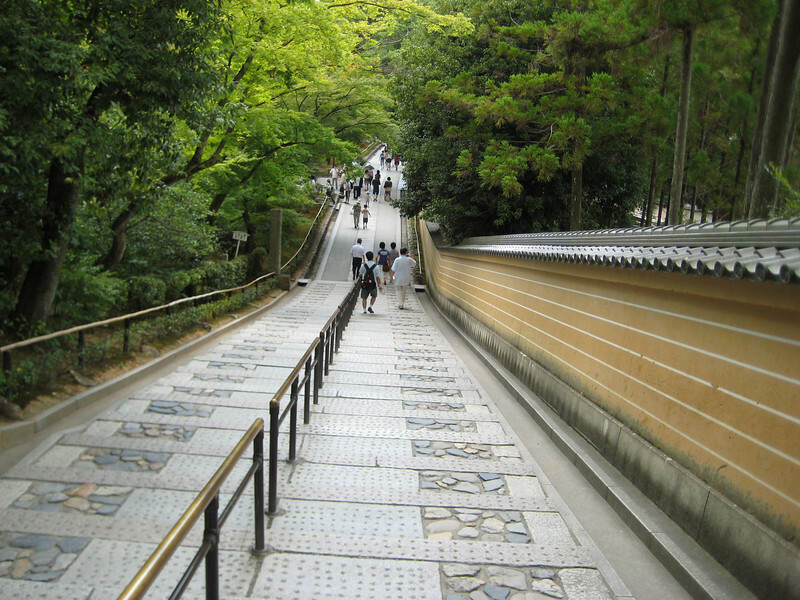 Initially we traveled along this 165 foot (50 meter) pathway between the main gate and the inner gate lined with a distinctive type of bamboo fencing. 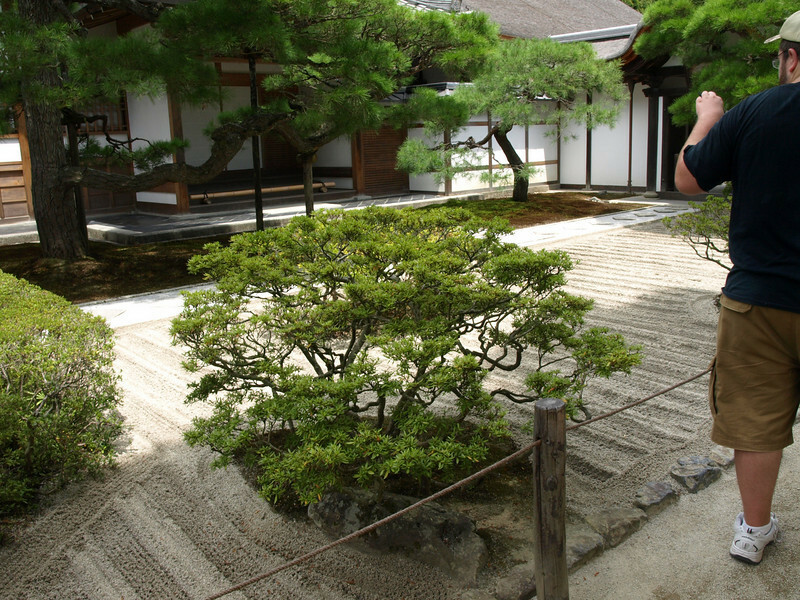 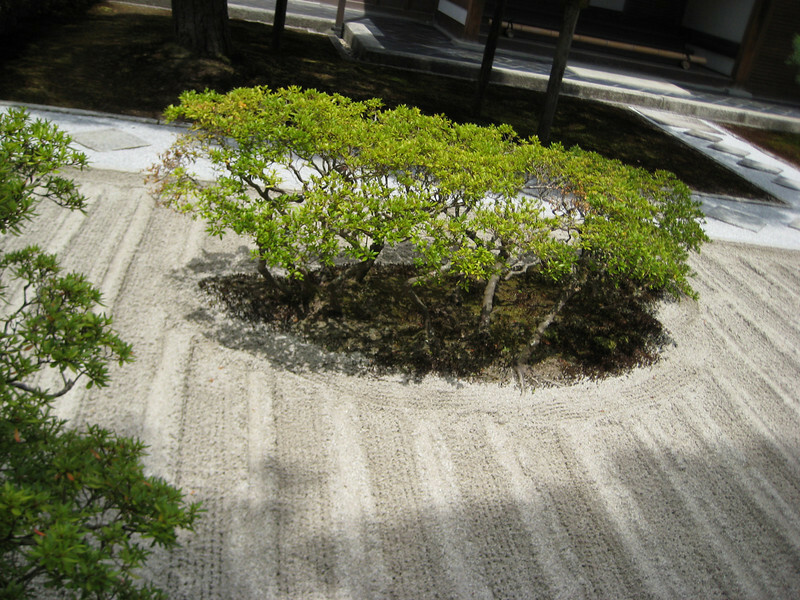 Josh takes a few photos of the various aspects of the sand garden (called karesansui). 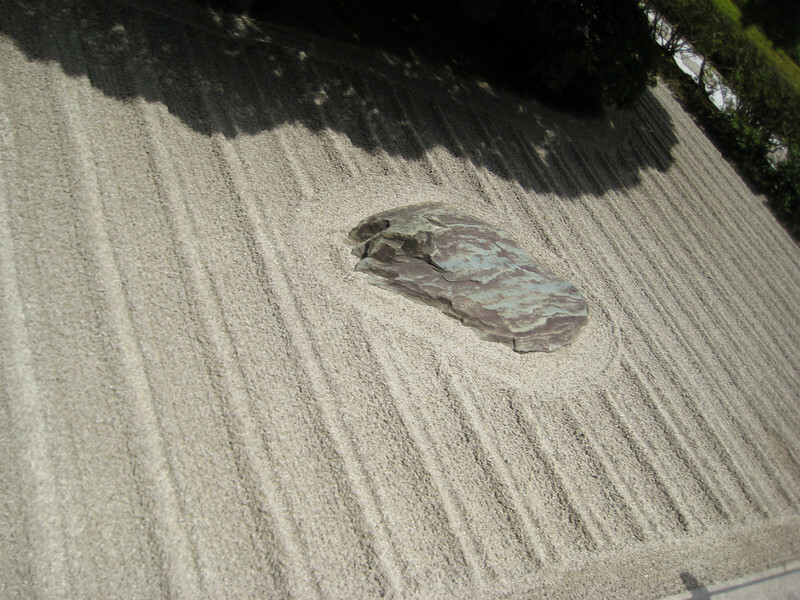 The rocks symbolize mountains in this miniaturized landscape. 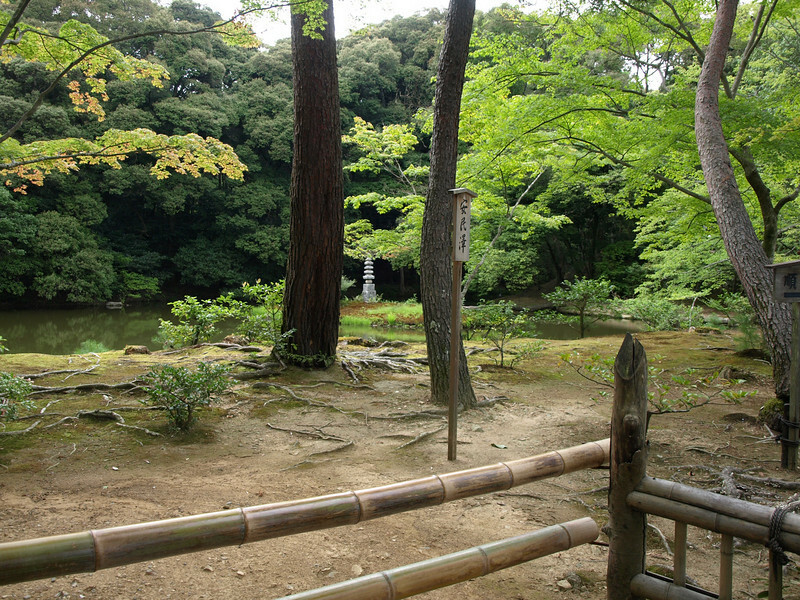 Think of the scrubs as vast forests. 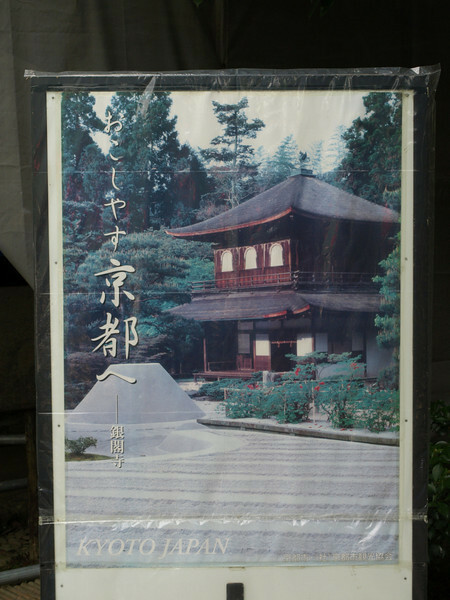 A sign next to the temple gives us an idea of how it should look. 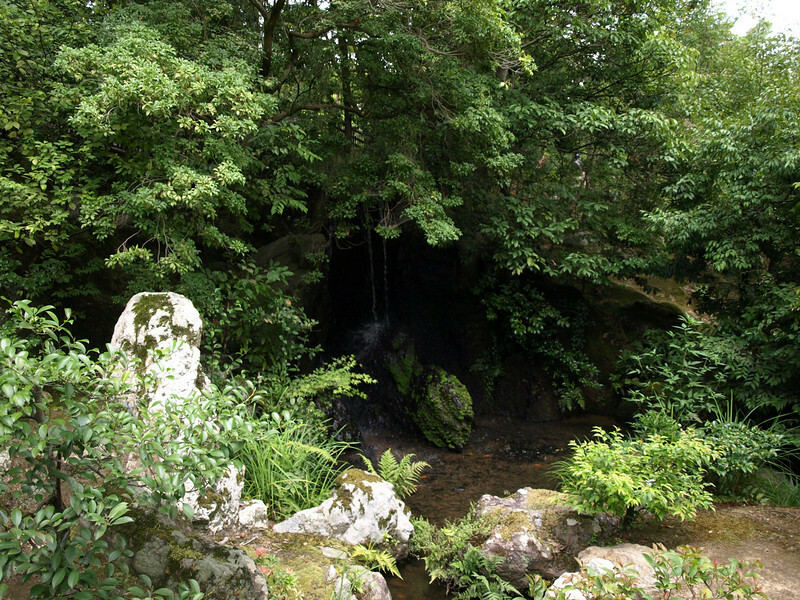 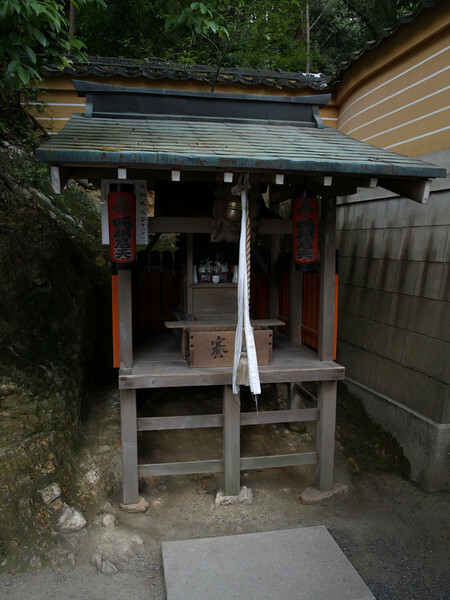 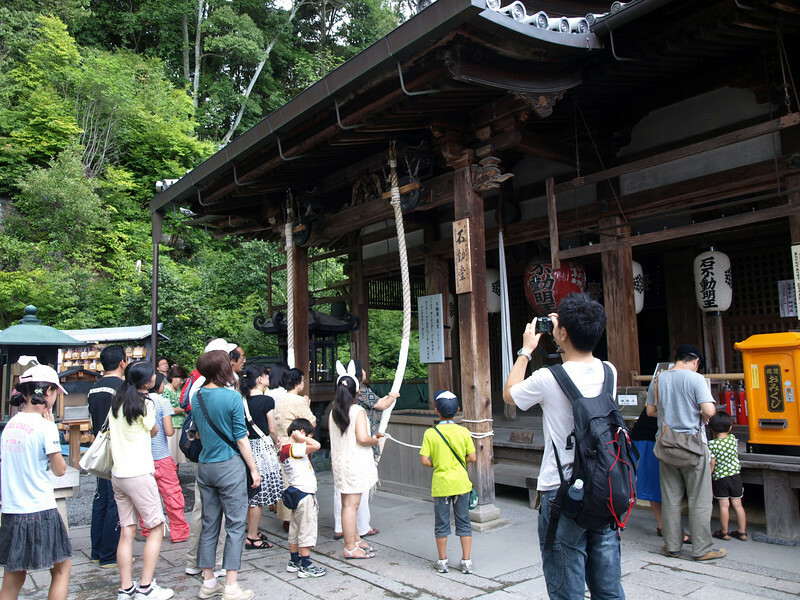 As we walk, we see a small shrine off to one side. 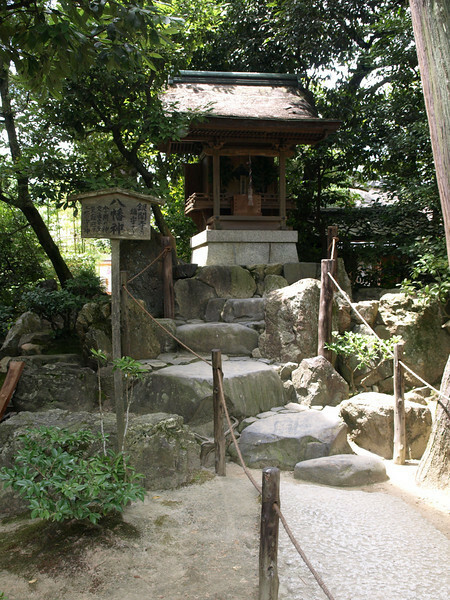 This is the Kôgetsudai, the Moon-Viewing Platform. 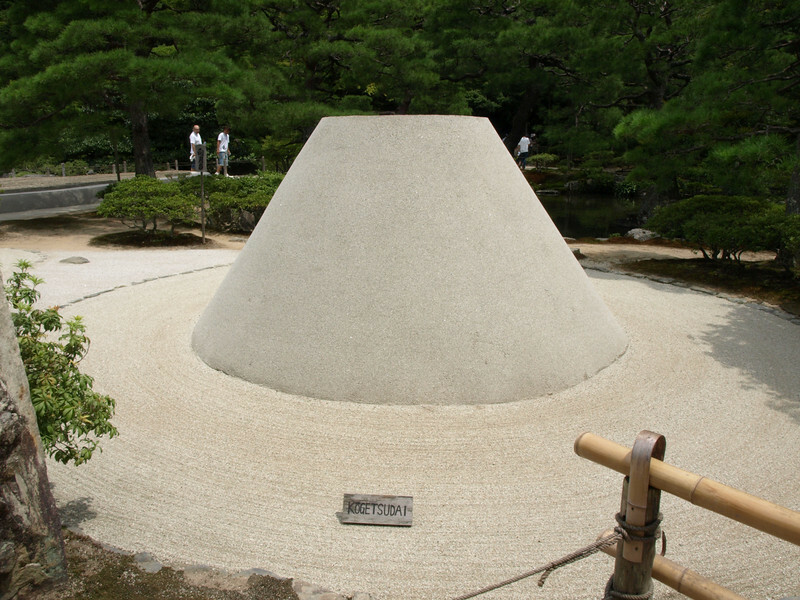 The idea here is that an observer would sit on this mound while waiting for the moon to rise from the Higashiyama mountains. 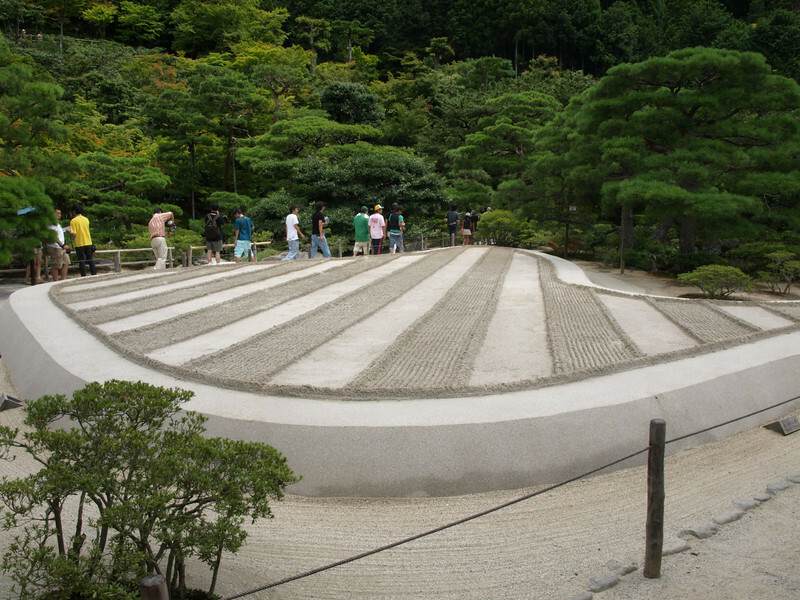 The Sea of Silver Sand (Ginshadan) would reflect the light of the moon as one watched the moon rise while sitting on the top of Moon Viewing Platform. 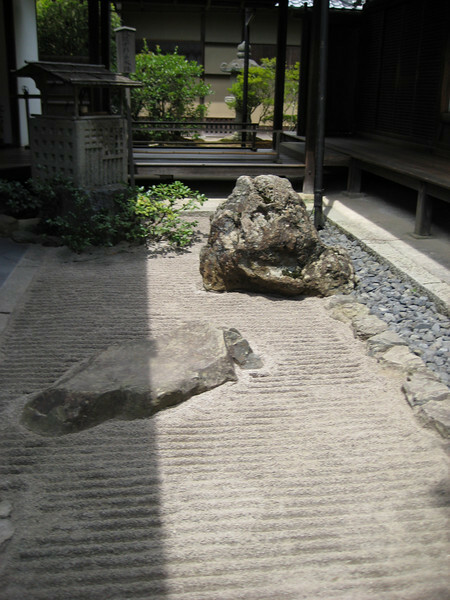 On the other side of the walkway, this little rock garden separated two buildings. 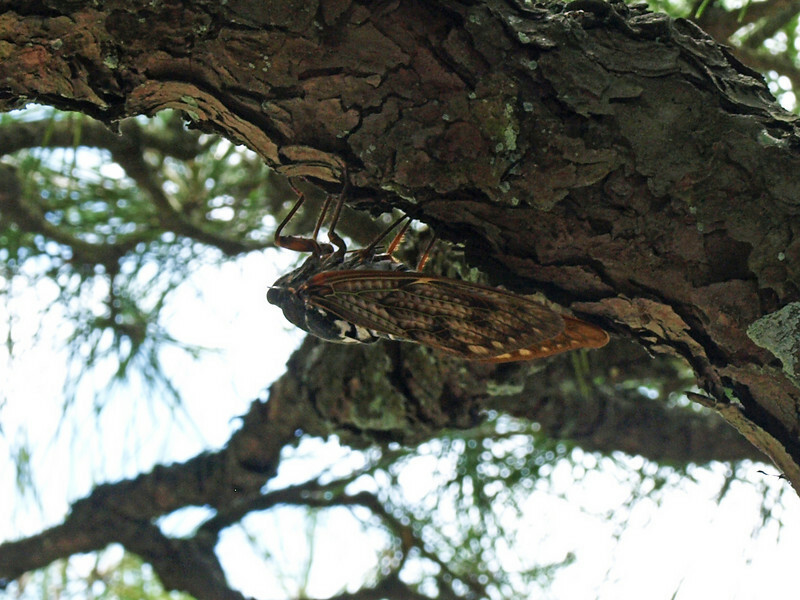 we finally see one of the cicada, that we hear chirping almost everywhere we go. 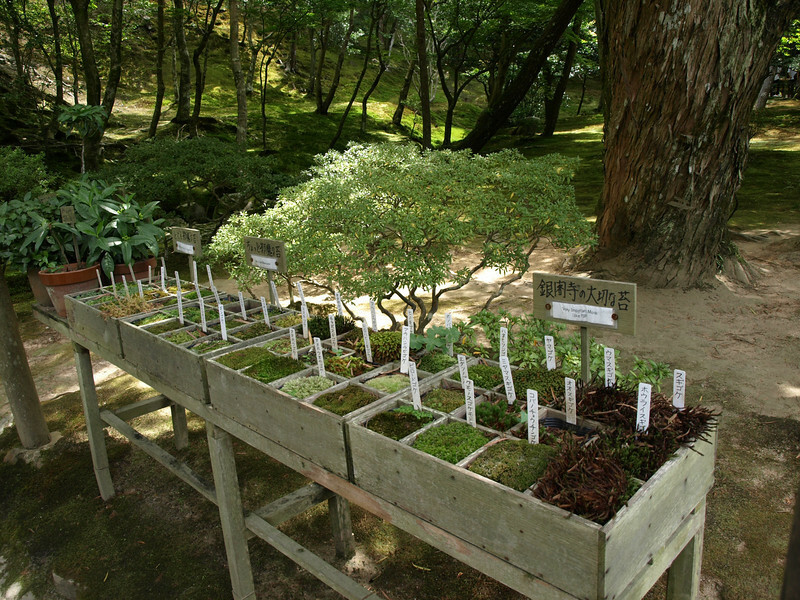 A little herb garden, with plants likely used for landscaping in the rock gardens.